Our system of representation in the United States House of Representatives is broken. That should be apparent to anyone living in this country, but let me give some examples. Supposing you’re a Democrat living in farm country, South Carolina. Does your local representative lend your voice to the workings of congress? Supposing you’re a Republican living in Boston. Does your vote even matter when you go to the polls? And if you’re a diehard Libertarian or Green Party member, your options for representation are even more frustrating. This is a sorry state of affairs considering our country was founded by men who once chanted “no taxation without representation.” The House of Representatives was designed to represent local, regional interests (which generally corresponded to ideological interests). Today we’re a much more ideologically diverse society, and those divisions of ideas aren’t really easy to divide up geographically. But how do we fix it? My proposal is to completely overhaul the method of election for members of the House of Representatives. This should be done by changing the system to incorporate two election types, one held on the first year, which we’ll call Year A, and the next held on the subsequent year, which we’ll call Year B. The following year would then have election type A again, followed the next year with another type B, and so on. 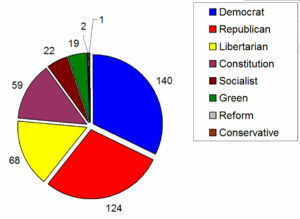 During Year A, individuals would vote for their parties of representation, choosing both a primary and secondary party to represent their interests. A vote for a primary party will give that party 7 points. Three points are awarded to the secondary party. 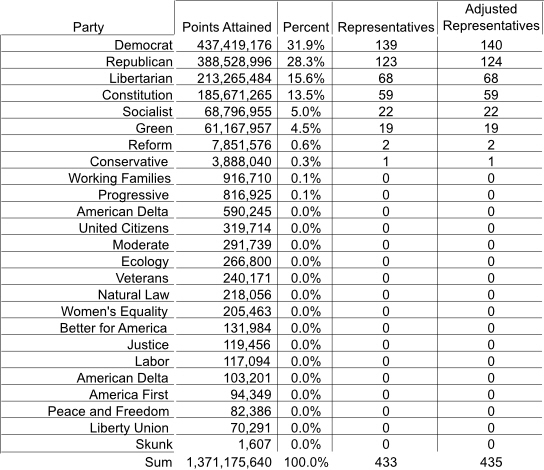 The points for each party are tallied nationwide, and this sum calculated as a percent of total points in the country. See the fictitious example below. The next step is to take these percentages and multiply them by the total number of members of the House of Representatives (Constitutionally 435*). Note this results in some parties not receiving any representation, but that won’t be the same every year, and even some very small parties in this example will get a representative or two. The composition House of Representatives will look like the pie chart shown, with a mosaic of parties and interests represented. However, after the election in Year A, nothing actually changes in the House until Year B. This means that anyone voting for a Reform Representative in New Mexico, Hawaii, California, etc. 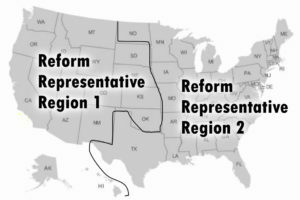 will be voting for a Region 1 representative, and everyone on the east coast will be voting for a Region 2 Representative. The Democrat Party on the other hand won 140 representatives. I’m not going to draw how they might divide it all up, but you can imagine they may choose to give most states three regions, with small-population states only getting two, such that the nation is divided into 140 regions. I’ll show how they may choose to divide up Texas (it’s the biggest and easiest to see) and you can use your imagination for the other states. When Year B elections roll around, every voting precinct will have a ballot for each party. 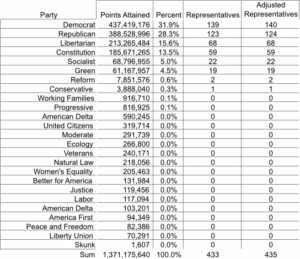 In the above example, there will be a total of eight parties (Democrats, Republicans, Libertarians, Constitutionalists, Socialists, Greens, Reformers, and Conservatives), but there could be more or less depending on Year A’s results. Voters in Year B will again choose two parties to represent their interests, but instead of voting for the actual party, they will vote for their top two candidates within those two parties (again with the number one choice getting 7 points, the second getting 3, and the winner being the one who gains the most points). 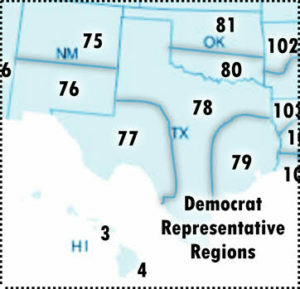 For example, Roberto in central Texas chooses to vote for the Reform Party and Democrat Party. The Reform Party gives him a list of individuals for their Region 2, and the Democrat party will give him a list of individuals for their Region 78. He votes for his favorite two candidate in each of these races. Meanwhile, Roberto’s next-door neighbor Sue can choose to vote for Republican Region 66 candidates and Libertarian Region 41 candidates (or whichever regional number those parties have given central Texas). Both Roberto and Sue live in the exact same area, but each will have representatives that see to their interests, despite having very different views. What a concept. 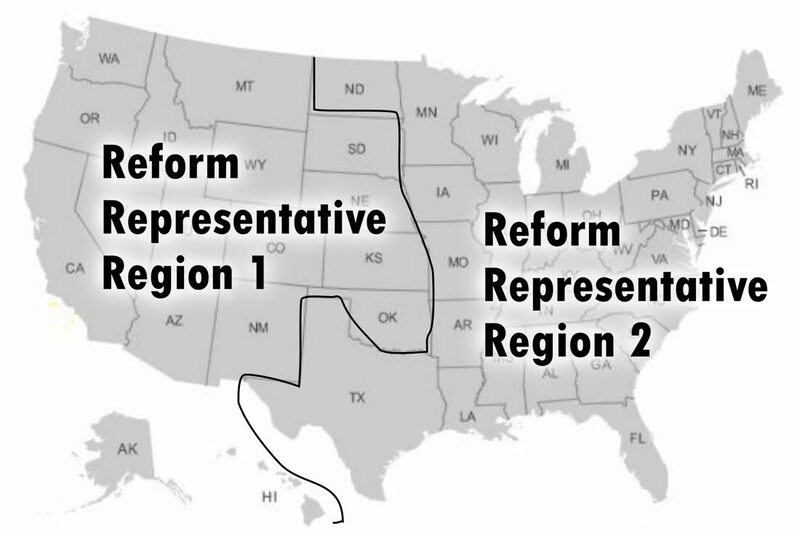 But, you might say, does it really make sense to have a single representative to cover the entire Eastern region (as in the Reform Party example above)? Well, considering only a small percent of people in either region voted for that party, yes. You see, the representation is commensurate with the number of people who voted for that party. One man will still only respond to a few million. So you might ask, how does a party determine who goes on the ballots? Couldn’t a statist somehow end up on the Libertarian ballot? The answer is that the parties as private entities will determine for themselves who can and cannot be on their ballots. If they choose to use primaries so be it. If they choose to use a board of directors, it is their choice. If they choose to allow anyone, that’s up to them. And voters will know how it is done and vote accordingly in the future. Couldn’t a spoiler candidate be thrown into the Year B elections? Could the Democrats sabotage the Republicans by putting a liberal in the running and then getting their people to vote for it? First of all, I’m not big on giving credibility to conspiracy theories, but I’ll concede the possibility. But the Republicans would be stupid to open their roster eligibility to anyone. However, because we’re selecting our top two candidates, the opposing party would need to work harder to rig the election in this way. So what does this system do? At the very least, this allows every individual to have his or her interests represented, no matter where they live. Boston Republicans have a regional representative, as do farmland Nebraskans who lean left. And the Libertarians finally get a fair chance to shake things up. However, it is more powerful than that. Year A elections will be a battle for ideologies, not cults of personality. We’ll be back to winning hearts and minds, not tearing people apart for their beliefs. Year B elections will have individuals fighting to win a seat, but this seat is guaranteed to be for a particular party. Two Democrats might claw at each other to win it, but ideologically they are similar. More importantly, this infighting won’t spill over to reduce the chances of the party winning the seat. Furthermore, this system will enhance visibility of smaller parties. While initially I’d predict the outcome to look like the pie chart above, over time minority parties would probably gain strength. People would get more comfortable voting for a third party (or a sixth), and this may result in a change in the dichotomous choices in Senate and Presidency races. This is because news agencies would be required to pay attention to other parties. But how would the house function without a ruling party? In short – much better! It would require compromise and negotiation based on issues, not party lines. Libertarians and Democrats may agree on one topic and thus form a coalition, but Democrats and Republicans may unite on a different topic. You might say, this is all well and good but I don’t see congress voting to change the constitution so they can lose their jobs. And I agree. But our founders were wise enough to allow us a different way of altering the constitution outside of the normal Washington politics. It’s called a convention of the states and you can learn about it in this fun video here. *Note that due to rounding, the number of representatives summed at the bottom of the chart may be greater or less than 435. If the sum is less than 435, more representatives must be added. Representatives are added to the most populous parties in order of popularity until the math comes out right. In this example, the calculated number of seats came to 433, so a seat was added to the Democrat Party and Republican party. But if the sum exceeds 435, seats will be taken away from those top slots in the same way.